St. Michael the Archangel, defend us in the day of battle; be our safeguard against the wiles and wickedness of the devil. May God rebuke him, we humbly pray, and do thou, O prince of the heavenly host, by the power of God cast into hell Satan and all other evil spirits, who prowl through the world, seeking the ruin of souls. Encourage me when I am disheartened. Help me to become more Christlike and so some day to be accepted into the company of Angels and Saints in heaven. hugs n’ blessings to all those praying tirelessly to battle the darkness in the world & send forth light. My youngest was looking over my shoulder. He would like to know where that statue is because he wants me to take him to it. St. Michael is his favorite. I suspect it’s not in Erie. 😦 you aren’t up to your booty in snow. Giggles, no. 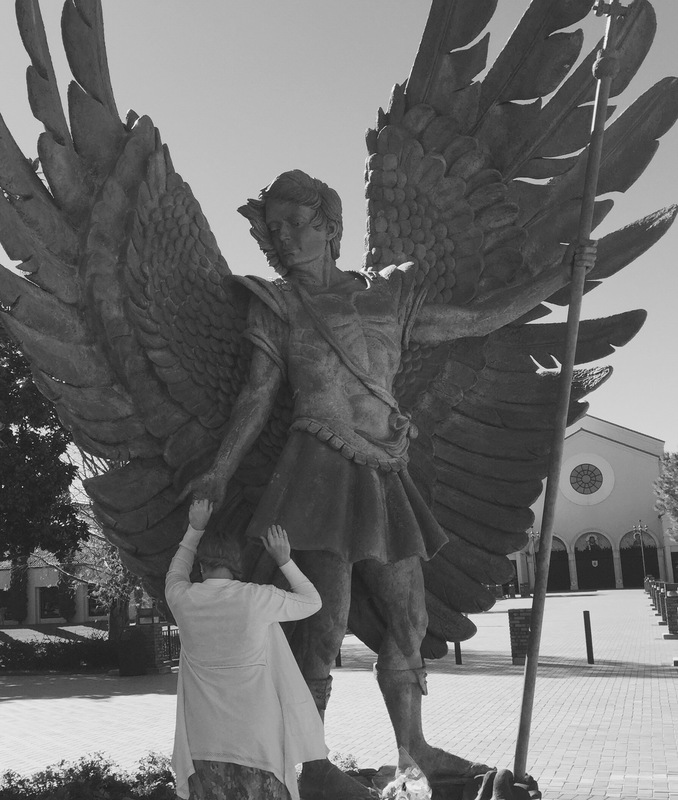 The St. Michael statue is outside of Our Lady Queen of the Universe in Orlando, Florida. Maybe a trip to see Mickie, Minnie & Michael is in your future?? 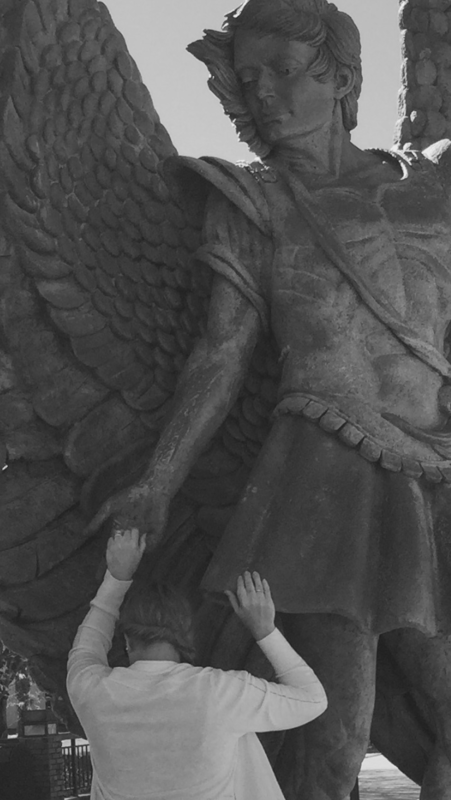 *The statue of St. Michael is one of my most favorite renditions…it is just as stunning from behind. I could just curl-up in one of his wings. 😊Hugs! I never got email you replied. I’m glad I checked. That will go on our list when we plan or wdw trip. I don’t have your email. I see your pins. Your April board, I wish I had more bible studies with you to ask you about it. Sarah…I will be creative and try to sneak you my private email. I do miss our scripture discussions and hearing all about the wonderful things you are doing with your little ones. They are so blessed to have you as their mom & spiritual nurturer! I will get creative and make sure you receive my email address, so that we may discuss not only the April board but many things together! Hugs until then! Powerful and beautiful image. It reminds me of the Peretti novel ‘The encroaching darkness”. His battle scene with the Host of Heaven warring with evil is very inspirational. May the Light of Christ in His full Glory backed by the Hosts of Heaven truly rise over our world in 2016. It is a spiritual truth that it is when the darkness is at its blackest and deepest that the stars in the nighttime shine the brightest. So it is with one bright and Holy Light in any dark place. Hugs to you too! Faye….your words bring tears to these eyes of mine. So much powerful wisdom in what you have shared. “A spiritual truth…” how quickly we forget that there is ONLY truth in what has been spoken to us by Him…it IS the Holy Light itself which guides us in the darkness. And His promise of Keeping our eyes lifted toward the Heavens is where we shall always find the stars!!! Thank you for your supportive encouragement & companionship on this spiritual walk I embrace! AND thank you caboodles for the bright hugs! !